According to Wikipedia, "the Works Progress Administration (renamed in 1939 as the Work Projects Administration; WPA) was the largest and most ambitious American New Deal agency, employing millions of unemployed people (mostly unskilled men) to carry out public works projects, including the construction of public buildings and roads. In a much smaller but more famous project, the Federal Project Number One, the WPA employed musicians, artists, writers, actors and directors in large arts, drama, media, and literacy projects." The poster was part of the Work Projects Administration Poster Collection at the Library of Congress Prints and Photographs Division in Washington, D.C. 20540. 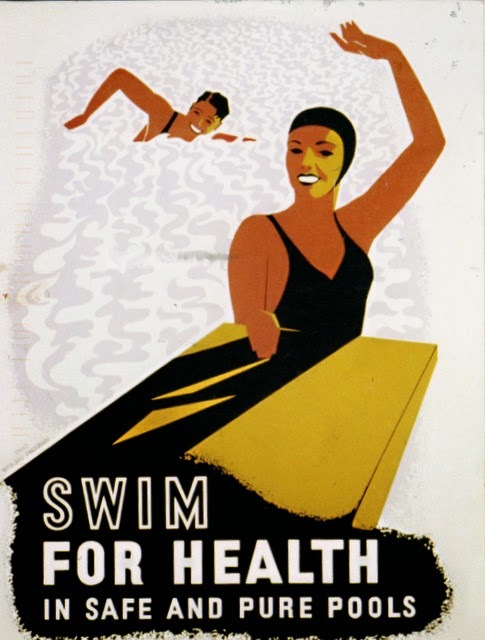 It promotes swimming as a healthy exercise by showing a man and a woman in a swimming pool.